This morning feels like a ramble on type of day. My mind is flitting and not really focused. It’s always interesting in my head on these days. Like a cornucopia of thoughts. Read this recently and it made sense. “If you want to be included, get involved.” If you’re wanting to be someplace that doesn’t want to be inclusive, find another place. Find a kinder, nicer group of folks with which to work and / or play. Don’t worry about people who are not worrying about you. Just do it. It’s like me wanting to lose weight, but I don’t have a sensible diet nor do I exercise. That means I don’t want to lose weight enough to do what I should be doing. Be honest. And if you really want to get involved and you don’t know where to start, come by my office sometime and let’s visit. My office is at 116 NE 5th Street. And, no, it isn’t open all the time. If I have to do errands, go to a meeting, eat lunch, or visit Main Street members, the office is empty. So, a smart person will call ahead. The number is 580-338-6246. If you’re a movie goer, here’s a little Oklahoma Trivia. The new Pitch Perfect 3 movie has Muskogee native Ester Dean playing Cynthia Rose in the movie. It’s a wonder you’ve been functioning well without knowing that. But it’s better now that you know. Here’s a blurb with a great photo of a little kid holding a plate with a piece of apple pie. “Baking is a valuable life skill that helps kids learn math, create delicious food, and even possibly earn an income one day. At the Bethany (Okla.) Library’s free Apple Pie Time class, chefs ages nine and up can practice following instructions, measuring ingredients, and putting together a treat to take home and bake under their parent’s supervision.” Good job to the library for doing this. But, really, as a parent this is something you need to be doing with your kids. And even better, when they get fairly proficient, then they can just cook supper and you won’t have to worry about it. Worked for me. Missy was nine years old when she made the first family supper all by herself. It wasn’t fancy. Spaghetti and green beans. But she was proud. I was proud. And the hungry family was fed. Now she’s a math teacher. It all made sense after I read that blurb. Our library has a lot of great programs going this summer. Be sure to go to their facebook page and check out their events. They are things for all ages and most of them have little or no cost. They have a free movie on the 17th that looks really interesting. “Dancing in Jaffa” is shown at 4 pm. Bring your own popcorn, I’m thinking. Bring me some, too. The Y has a teen night for just $5 on the July 13 and 20. Call them or go to their facebook to find out more about these evenings of fun. Good places to get included. Let’s go back to the parenting ideas. Make it a point each evening before bed or at the dinner table to tell an interesting fact about someone in your family. Help your children know their roots. We know things and we forget to share them. Introduce your kids or grands to their family. When my preschool kids were starting to learn their numbers, I took them several times to play bingo in Goodwell. Back then the firemen, I think, had bingo night. The kids each got a card and they had fun. And they learned their numbers faster. Cool, huh? Who would have thought you could justify bingo night so easily? On July 22 is a Mexican Bingo night. The cards don’t have numbers, but pictures. It’s called Loteria. And it is happening from 4 – 7 pm at RC Party Room at 5th and Main. You can eat chicken fajitas for $10 a plate and drink virgin Margaritas. We thought it sounded so good “Fajitas, Margaritas, Loteria” but we wanted it to be a family event and we don’t have a liquor license. So, no booze in the margaritas. It works. Join us! 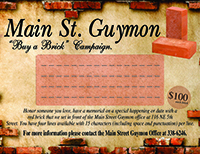 We would love to include you in this fun family night, a fund raiser for Main Street Guymon. You can work on your vocabulary … Spanish or English or both because the caller will be calling in both languages. Loteria cards are $1 each that goes to the pot and the winners of each game split ½ of the pot, with the rest going to Main Street Guymon. Did you hear that Main Street Guymon was named the Best of the Best Service Group? Wow. Thank you to all who voted for our Main Street volunteers. They work hard and they deserve recognition! Join us. We would love to include you.